Each year in early October, Albuquerque’s clear blue skies are painted bright colors as more than 500 hot air balloons lift off at the Albuquerque International Balloon Fiesta, the world’s largest balloon festival. 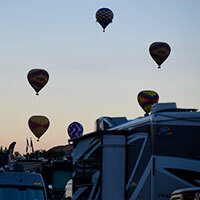 This year was no different, and Fantasy was there – hosting two back-to-back RV Rallies just two blocks from the Balloon Fiesta Park. With a 7-day and a 5-day Fantasy Rally attracting 101 and 103 rigs respectively, there was much going on at the Rally site. On arrival day, guests were treated to a visit to the International Balloon Museum, conveniently located close to our campsites. The Fantasy hospitality tent hosted some great meals and parties – all with a bit of a southwestern touch, beginning with a Fiesta Welcome Dinner that first night. Mornings come early at the Balloon Fiesta, beginning on Day 2 at 5:45 a.m. with inflation and ascension of the Dawn Patrol – all choreographed to music. Dawn Patrol pilots actually take off in the dark and fly until it is light enough to see their landing sites. Later that day, guests thrilled to the Special Shapes Rodeo – balloons resembling everything from Darth Vader to Yellow Sub to Van Gogh to Peg Leg Pete ascended into the air. 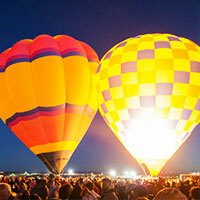 And they were back that evening for the Special Shape Balloon Glow, where the balloons are lit up at night. Fantasy guests also got up close and personal with the balloons themselves and enjoyed a private demonstration from one of the balloon pilots who brought his propane burners and basket and showed how he maneuvered his balloon. That evening, the group enjoyed nachos and margaritas at the Fantasy Southwest Fiesta, complete with musical entertainment. Another early morning with yet another Dawn Patrol and Balloon Glow awaited guests the next day. Or, you could choose to just sleep in a bit, step out of your rig and watch the action with a cup of coffee before heading to Fantasy’s Mimosa Brunch in the tent. WagonMaster Judi Bennett said “Actually, you never have to leave our campground if you don’t wish, as the balloons fly right over us and many land right next to the Fantasy tent.” There was even more action on Day 3 with another mass ascension, the famous Night Magic Balloon Glow that evening, all followed by the Afterglow Firework Show. Guests also enjoyed yet another Fantasy Fiesta with music and local Mexican and native dancers. And it wasn’t all about balloons. The following day, after the Dawn Patrol and ascensions, Fantasy guests boarded a private bus to visit one of Albuquerque’s most iconic areas – Old Town, established in 1706. Guests could stroll the famous Plaza, visit museums, discover quiet hidden patios and gardens, and of course shop at the more than 150 stores and galleries offering unique Southwestern gifts. They returned to the Rally for a delicious Fantasy BBQ Farewell Dinner that evening. 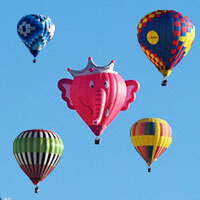 Fantasy will be returning to Albuquerque for the Balloon Fiesta in 2019 and again in 2020. The 2019 rallies are filling up fast but limited space is still available.